Roses are hardy flowers and, when they are cared for properly, will grow for many years. Part of caring for the rose requires trimming, which is also known as deadheading. Deadheading is when you remove the dead or faded flowers from the bush. This not only tidies up the plant, but also causes it to redirect the energy into producing longer stems and growing new leaves and flowers instead of sustaining dying and wilted flowers. Wear gardening gloves when trimming roses to protect your hands from the thorns. Use pruning shears with sharpened blades on both sides. The type with a blade on one side and a flat "anvil" on the other side tends to crush the stems instead of cutting them. Trim off the dead flowers. Look on the stem, below the flower (where the stem is as thick as a pencil) to the nearest five leaflet set. Locate the small swollen bump (where the new growth will emerge) that is pointing towards the outside of the bush. Cut about ¼-inch above the leaves with the swollen bump. Hold the pruning shears at a 45-degree angle when you cut, with the highest point of the angle toward the middle of the bush. This will cause new growth to emerge away from the center of the bush, allowing more air flow to the bush, which deters fungus and disease. Smear some household glue over the cut stem if it is larger than a pencil width thick. This will act as a band aid, sealing the cut and preventing insects from entering the rose. Don't worry if the leaflet set turns yellow and falls off several days later. This is normal. Clean up all rose debris and discard it. Do not add it to the compost, as it creates a perfect home for insects and fungal spores. 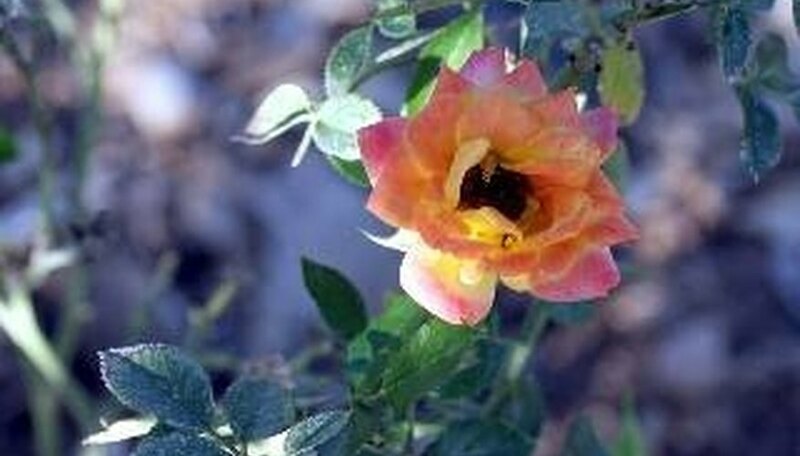 Stop deadheading the roses before the first freeze to allow the bush to go dormant. Stems that are thinner than a pencil thickness cannot support rose blossoms. Cut these stems back to the main stem.